Google Earth’s latest edition was just released and guess what? It has a Mars setting! There was a way to overlay Mars data on the Earth globe in previous versions, but now that’s no longer necessary: just click a button and you’re on Mars. You can choose from a variety of global maps including topography, Viking images, Day and nighttime infrared, and visible color. 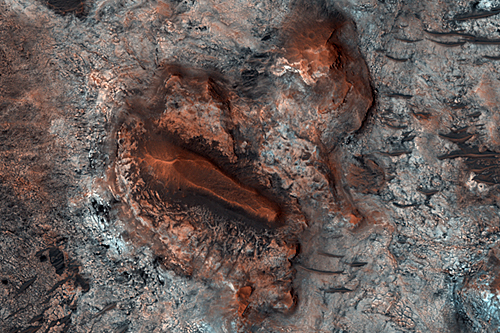 It also has footprints for high resolution cameras like HiRISE, CTX, MOC, CRISM, and HRSC, with links to the full-resolution images. And most exciting, it has 3D topography! Now you can fly around in Valles Marineris or check out the view from Olympus mons. 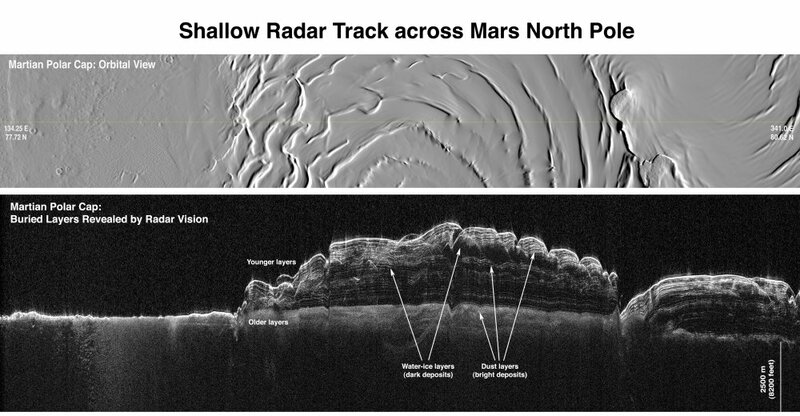 The view from the edge of the Olympus Mons caldera in Google Mars. Olympus Mons dominates the horizon in this Google Mars view. Another way-cool feature is the ability to zoom into panoramas taken by rovers and landers, as shown here for Opportunity. The Opportunity rover's traverse. Each camera icon is a panorama that you can zoom into. Part of the Rub al-Khali panorama taken by the opportunity rover. And finally, you can load selected Context Camera images right onto the globe, to take a high-res look at areas of interest, such as the Olympia Fossae troughs shown here. I don’t know what’ you’re waiting for: go download the program and try this out for yourself! 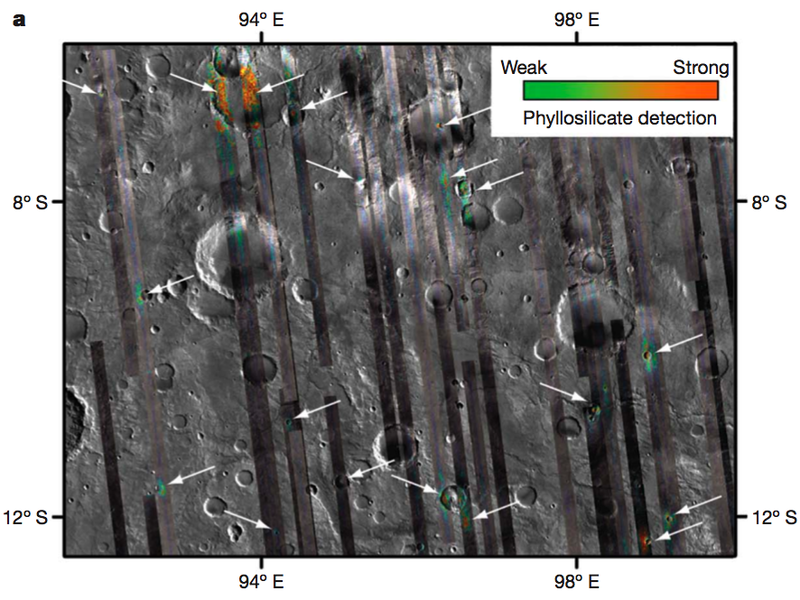 CTX image of the Olympia Fossae troughs. 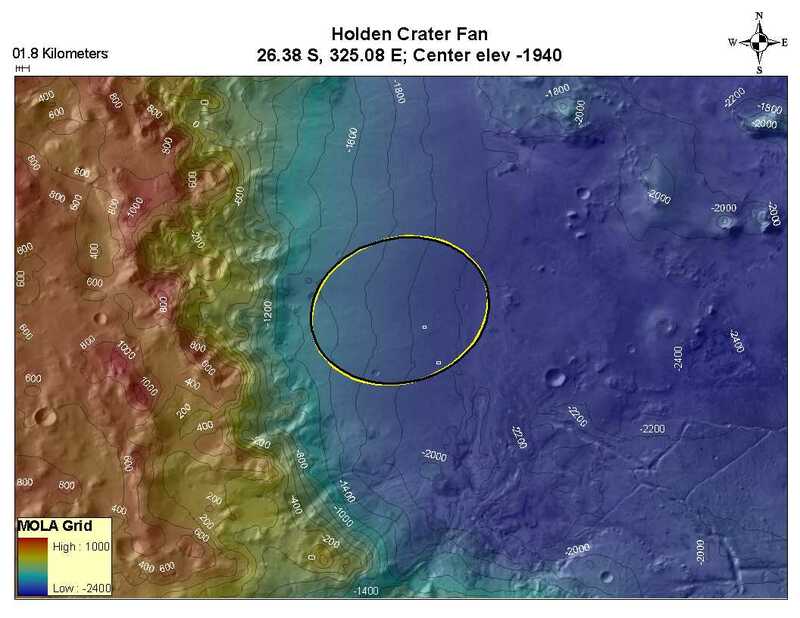 The next landing site that we heard about was Holden Crater. Holden is a 154 km diameter crater formed early in martian history that happened to fall smack in the path of an extensive fluvial system. There was a long chain of craters connected by water-carved channels and then the Holden impact occurred and interrupted that flow. It looks like Uzboi vallis, one of the channels, then breached the rim of Holden crater and began to fill it with water, but there is no exit breach, so the Holdin basin apparently became the end of the line for water. When Uzboi vallis broke through the crater wall it caused a pretty violent flooding of the crater and carved into light-toned layered deposits that may have been laid down by an existing lake. 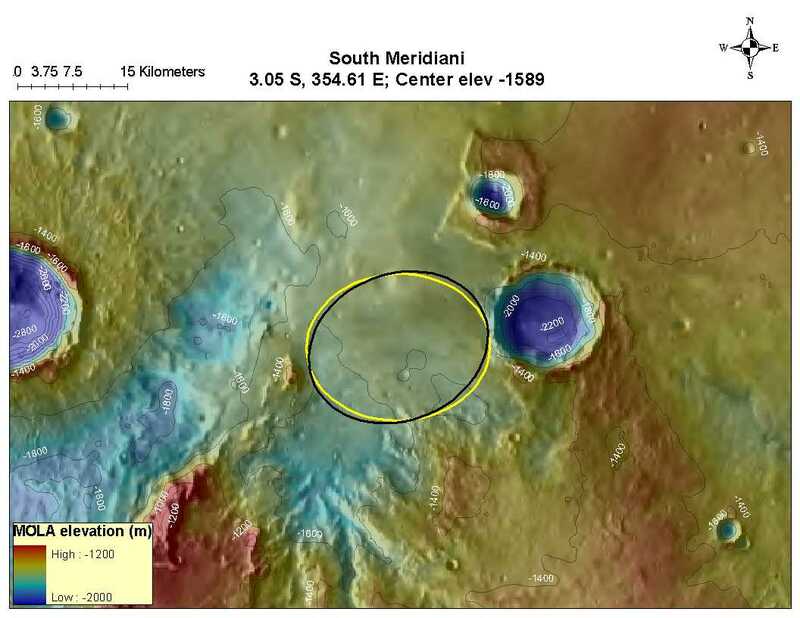 The landing ellipse is on a “bajada” which is a fancy term meaning lots of alluvial fans. (an alluvial fan is a fan-shaped deposit that forms downhill of a rocky location eroded by water) The bajada is nice and flat, but still contains some interesting inverted channels, and studying the fans could tell you about how much water was available to form them. 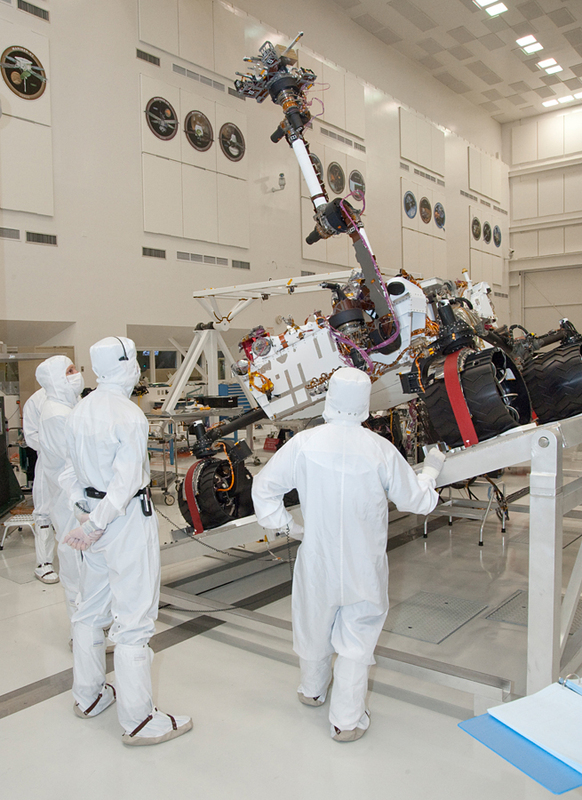 In other words, the fans could tell you about the early climate on Mars! There are light-toned layered rocks at the edge of the fans and near the Uzboi vallis wall breach that look like they were probably deposited by a lake. These rocks have very thin layers that can be traced for many kilometeres in HiRISE images. The lower units of these deposits also have a clay signature, which is good for the preservation of life. An interesting point was that the clays apear in both the crater rim and the layered deposits in the crater, so we may have an identified source and sink. It was pointed out that the lack of phyllosilicate diversity could mean that ther were fewer chemical gradients for life to take advantage of. But then the counterpoint was raised that the atmosphere-water contact would be a great chemical gradient, and if there are only chemotrphs (no photosynthesis) they would likely take advantage of that. To me, Holden seems like a fine site, but I got the impression that i just doesn’t have people excited. This may be because it doesn’t have a large group following like some other sites do. On the other hand, it has some diverse morphologies and interesting mineralogy, and could teach us a lot about the arly climate on Mars. 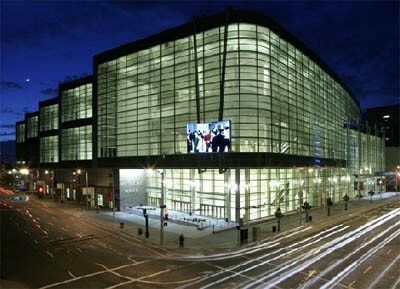 Still, my prediction is that it won’t survive this week because for whatever reason it does not have people as excited as other sites. 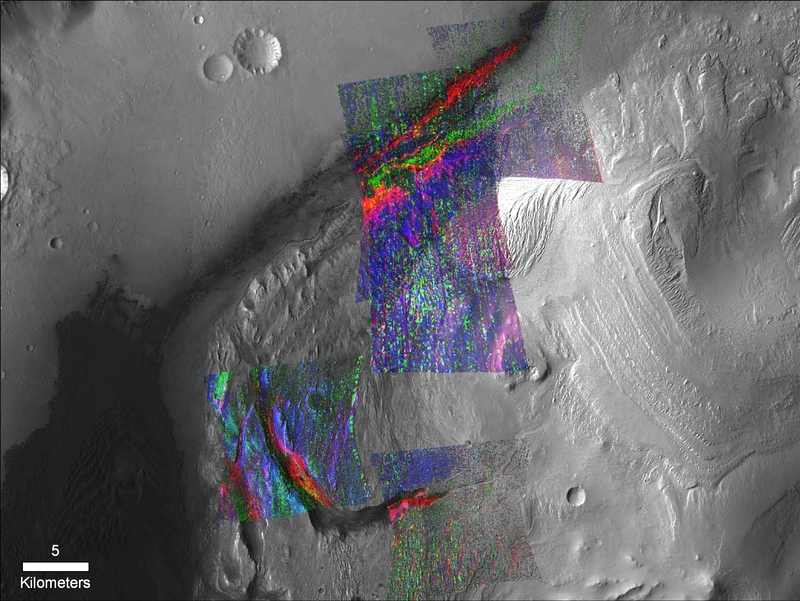 The evidence for a warmer, wetter ancient Mars just keeps piling up! 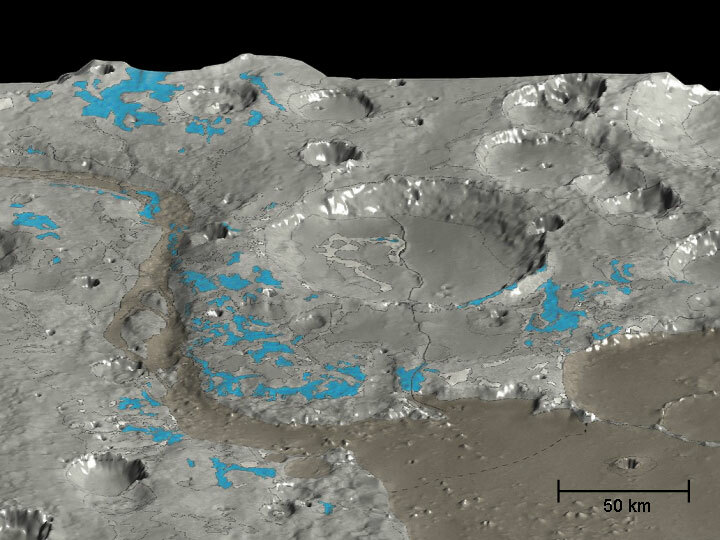 In 2 new papers, the team for the CRISM spectrometer onboard NASA’s Mars Reconnaissance Orbiter has reported new evidence for water on the surface of ancient Mars, based on the ubiquitous presence of water-bearing minerals. Universe Today has a great post up on the findings, so I won’t repeat too much of Nancy’s explanation. 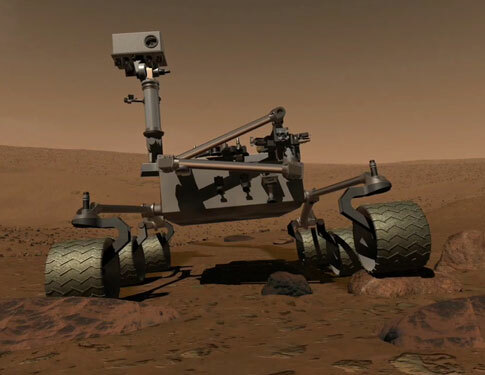 In brief, the CRISM team has identified a whole new suite of minerals on Mars, in addition to a few already observed, that only form with copious amounts of water. While some of these minerals are associated with local deposits that look like sedimentary layers set down by surface water, others seem to be present across vast regions of the ancient southern highlands. In particular, the minerals tend to be associated with the ejecta, floors, and central peaks of craters in the ancient terrains. 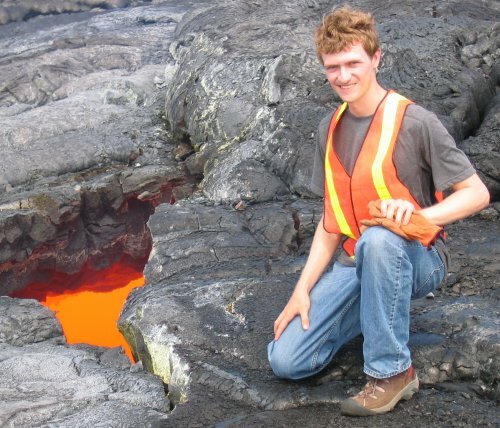 Because the impacts probably dug up the minerals from several kilometers down in the crust, the crust must have been altered by water to at least that depth. 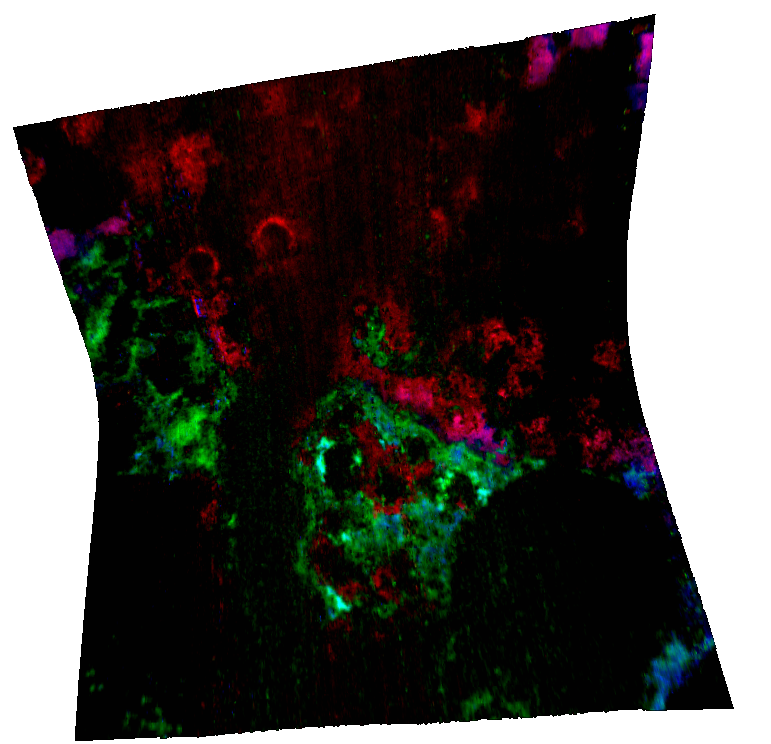 For example, the image below shows where CRISM has detected phyllosilicates (a hydrated clay mineral) in one region of the highlands. 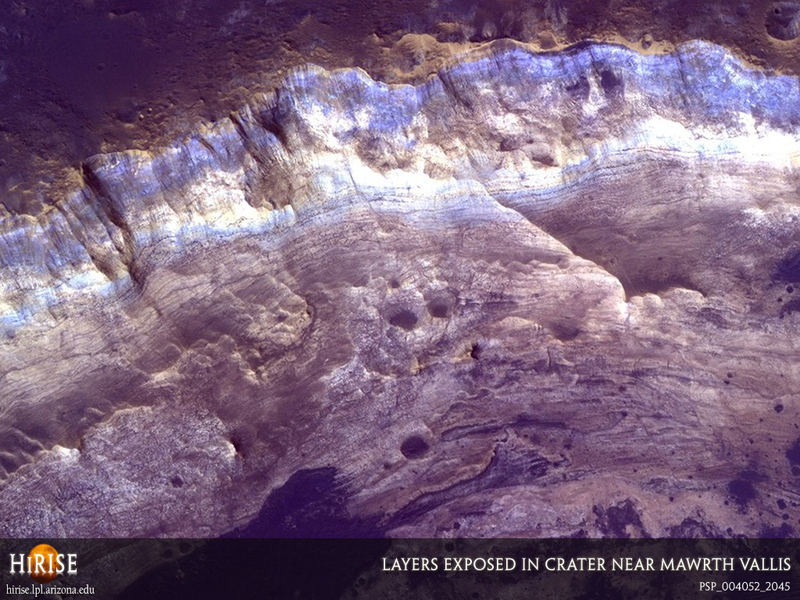 Because almost every crater has a phyllosilicate detection, the basement material has probably interacted with water throughout this region.